One person has died after the Iranian city of Kermanshah, close to the Iraqi border, was hit with a magnitude 5.9R. A series of three earthquakes, included one at magnitude 6, have struck western Iran, with state media reporting one person has been killed and some 100 others injured. 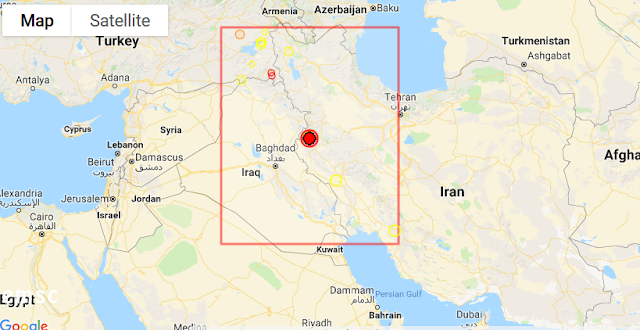 The US Geological Survey says two other earthquakes magnitudes 4.4 and 4.2 respectively struck early on Sunday near the city of Javanrud in Iran's Kermanshah province. The state-run IRNA news agency quoted Kermanshah Governor Houshang Bazvand for the figure of the injured. The news agency reported a 70-year-old man died of a heart attack in the midst of the earthquakes. In November 2017, a major 7.3 magnitude earthquake struck the same region, killing over 530 people and injuring thousands in Iran alone. In Iraq, nine people were killed and 550 were injured. Iran sits on a series of faults that cause earthquakes. Our prediction was given in the Iranian Calendar about the possibility of an earthquake in Iran at the beginning of the month, and yesterday before the event we remined our readers about the possibility of an earthquake in Iran today.